Link Error – Unfortunately, this advertiser is no longer active. 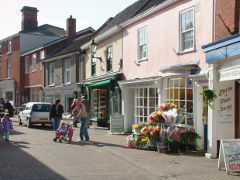 Halesworth is a market town in north east Suffolk, about ten miles inland from the Suffolk Heritage Coast, in a lovely area good to live in or to visit at any time of year. East Anglia is renowned for its big open skies and mild and dry climate. This makes a stay here very pleasant. 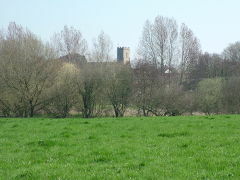 The surrounding area is popular with walkers, bird-watchers and cyclists. For a holiday or short break our advertisers offer accommodation on a self-catering, hotel or bed and breakfast basis where you will be most welcome. Travel links are good. Halesworth railway station is on the East Suffolk line with connections to Norwich and London Liverpool Street. Halesworth Station retains its notable moving platforms, although now no longer in use. These swung to allow the passage of road traffic and are quite remarkable.The station buildings are now home to the Halesworth Museum. Modern buses connect to other Suffolk towns such as Beccles, Southwold and Lowestoft and to Norwich. National Cycle Route 1 passes through Halesworth and its Millennium Green. Central to the town is Thoroughfare, once the busy sole route through the town but now by-passed and pedestrianised so it is a pleasure to stroll along, look in the shops and then from the bridge watch the antics of the ducks on the Town River. Thoroughfare leads to the Market Place where more lovely old buildings stand. 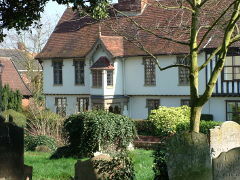 St. Mary’s Church and the old almshouses lie beyond. The shops in Halesworth are a treat! Shopping like it used to be. A good range of shops, many independently owned, selling everyday items plus local meats, food and produce, clothing, stationery, gifts, wholefoods, home brew items, electricals, antiques, fruit and veg, books, carpets. Professional services are here too - opticians, solicitors, dentists and more - and plenty of opportunities for light refreshments or a restaurant meal. At one end of Thoroughfare is Bridge Street and the splendid library and it is then just a few minutes walk to The Cut Arts Centre - performing arts in a converted Maltings. 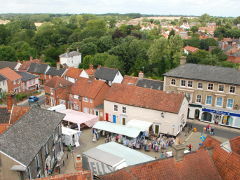 In the Autumn the annual two-week long Halesworth Arts Festival presents the majority of their events here. To know what's on in Halesworth and the surrounding area all year round go to the Blythweb Calendar. Steeped in the history of brewing, malting and agriculture, Halesworth in modern times is a wonderful mix of old buildings and new, where local people have the advantages of the twenty-first century while secure in the roots of the past. Search for Self Catering properties around Halesworth.